This webinar will cover how to use the crosswalk from the Steering Committee to interpret information that is being sent to you by each of the health plans. 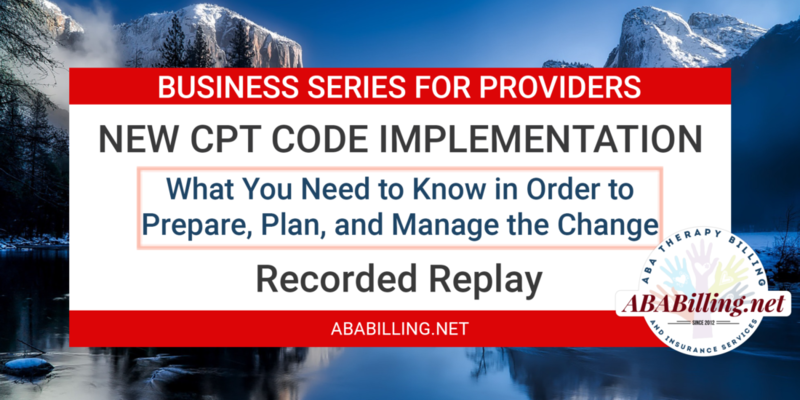 Also, how to ensure that you are prepared to receive all information for changes as an in-network provider, examples of comparing the Steering Committee intent of the codes with the information received from the health plan, and what to discuss with your provider reps to gain your own individual clarity and documented information related to implementation. We will also discuss the impact on authorizations and claims submission for the changes. We are all in this together as an ABA community, and I will do my best to give suggestions on how you can successfully prepare, plan and manage the change. All agency owners and management should take ownership in this process and not leave it to chance, follow social media guidance only, or outsource the full impact of this critical change in our industry.